This year the meeting was held on the 12th & 13th November, and there was an amazing line up of speakers presenting research on a wide array of topics, cumminating with a keynote presentation from Professor John Hardy of UK Dementia Research Institute at the University College London who provided a master class on “Genetic dissection of Parkinson’s“. Prof Hardy holding court – his presentation was amazing! 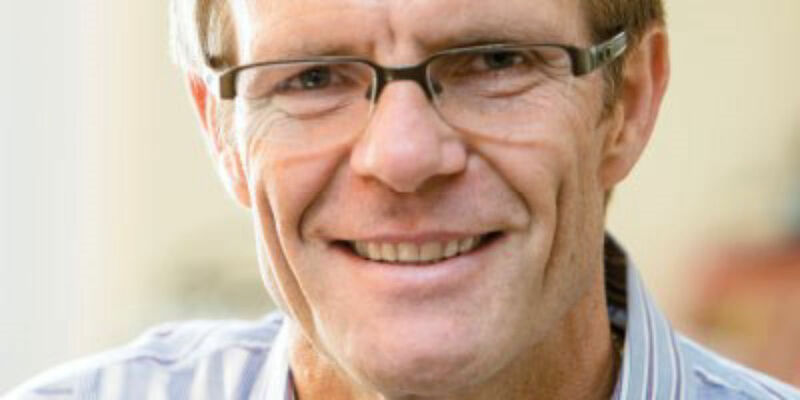 Prof Hardy is a world renowned expert on the genetics of neurodegenerative conditions. His talk was both educational (providing a broad view of the genetic risk factors associated with the major neurodegenerative conditions, including ALS and Alzheimer’s) and entertaining (he threw in a great balance of humour). “We see weak evidence for innate immunity & strong evidence for adaptive immunity” (meaning, there is more evidence for a change in the immune system over a life span in Parkinson’s, rather than people being born with a genetic weakness in their immune system). 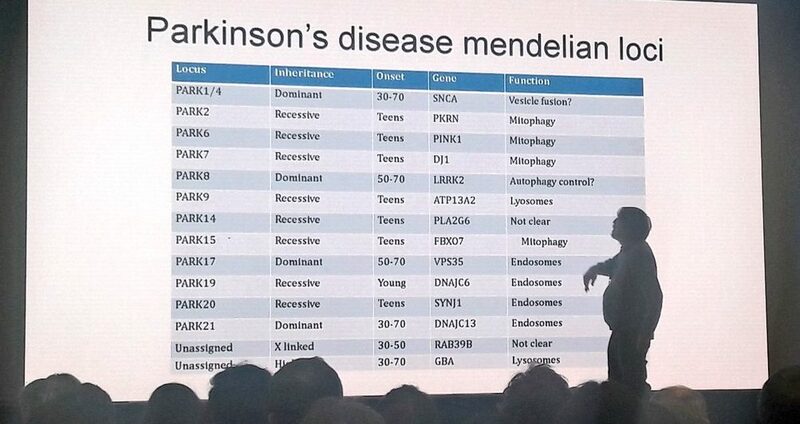 While Alzheimer’s has a strong genetic component (perhaps as much as 80%), Parkinson’s could be a lot less (maybe just 25%). It was a tour de force – that finished the first day of the conference with lots of food for thought and topics to be discussed during dinner that night. And of course there was a great deal of other research discussed during that first day! The first session in the morning on the first day was focused on “Alpha synuclein: from animal models to clinical translation”, and one of the presentations that stuck out for me here was given by Dr Hui Jing Yu – Medical Director from United Neuroscience. This biotech company is focused on developing a new class of vaccines that are fully synthetic (they call them ‘endobody vaccines‘) and can train the body to treat/prevent neurological condtions. Dr Yu explained that the endobodies have made an impact on animal health with over 3 billion doses being administered in veterinary applications, and United Neuroscience is now shifting this technology to humans. The first clinical data – in Alzheimer’s – will be presented at next Alzheimer’s and Parkinson’s Diseases (ADPD) meeting early next year in Lisbon (Click here to read more about that study), but the company must be confident about the results as a Phase II clinical trial is now ongoing (Click here to read more about that study). 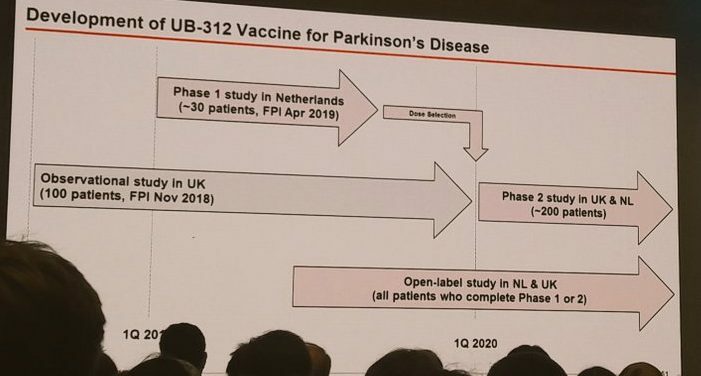 At the Parkinson’s UK conference, Dr Yu presented preclinical data demonstrating that their Parkinson’s treatment (called UB-312) selectively targets and prevents the accumulation of misfolded alpha-synuclein proteins in cell and animal models of Parkinson’s (Click here for the press release about this presentation and click here to read a previous SoPD post explaining vaccine approaches for Parkinson’s). After lunch, there were parallel sessions: One on “Mitochondrial dysfunction and oxidative stress: towards new agents of neuroprotection” and another on “Drug Discovery in Parkinson’s” – I found myself dashing between sessions to catch particular presentations. Of interest during this session was a presentation from Jaime Domingues from BenevolentAI (presentation entitled “Artificial intelligence pathways for drug discovery“). 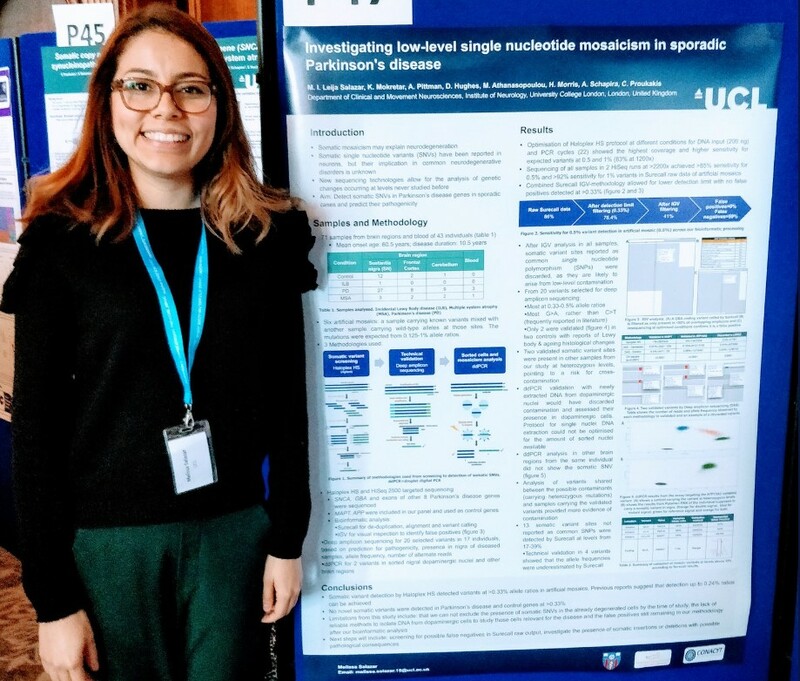 This talk was part of a collaboration between Parkinson’s UK and The Cure Parkinson’s Trust to identify new treatments for Parkinson’s using the artificial intelligence platform being developed by BenevolentAI (Click here to read more about this project). We will be addressing the idea of using artificial intelligence for PD in a future SoPD post (in the new year), but for readers interested in this idea, Parkinson’s UK recently held their Florence Pite Memorial Lecture at which Prof Jackie Hunter of Benevolent AI was outlining the Parkinson’s UK/Cure Parkinson’s Trust project. After a coffee break there was a second pair of parallel sessions. One on ‘Allied Heathcare‘ and another on ‘Patient and Public Involvement (PPI)‘. And during these sessions I found a panel presentation very interesting. It was on ‘Presenting the Parkinson’s Exercise Framework‘. Chaired by Fiona Lindop – a specialist physiotherapist in Parkinson’s and Therapy Lead for Parkinson’s UK Excellence Network – this session looked at methods of integrating exercise into the treatment of Parkinson’s. On this panel were Dr Bhanu Ramaswamy OBE and Dr Katherine Baker and Dave Lattimer who discussed the development of the Parkinson’s Exercise Framework. After this, there was a short break before Prof Hardy gave his keynote presentation, which perfectly completed the first very full day of research presentations. The next morning, things kicked off with a session on ‘Clinical trials‘. Rather than focusing on any specific trials, however, the presentations during this session were discussing the need for better diagnostics/tools of assessment, and stratification of participants in clinical trials. Thus, the question has to be asked if individuals with higher levels of inflammatory markers can be fairly compared in a clinical trial with participants who have low levels of inflammatory markers. Obviously not. So perhaps some form of screening should be conduced before a clinical trial starts. Also speaking during this session on clinical trials was Professor Anette Schrag, from University College London. 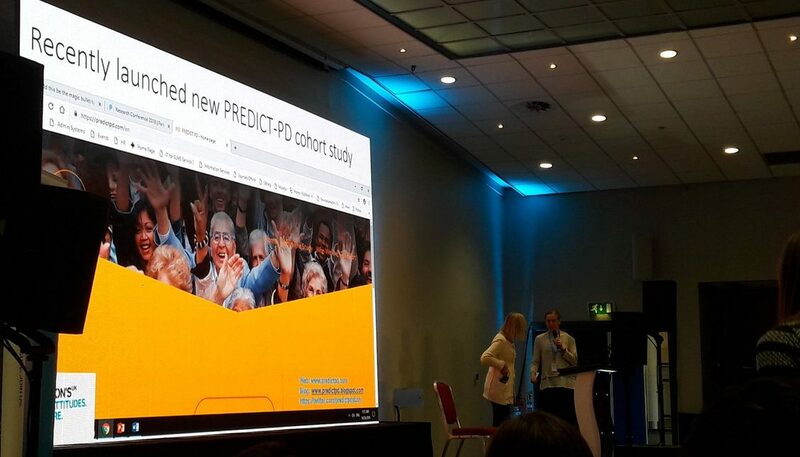 She was discussing ‘Early diagnostics/prediction of disease onset’ and at the end of her presentation, Prof Schrag was keen to make the audience aware of the launch of the new PREDICT-PD study. PREDICT-PD is a “a ground-breaking project using simple tests to identify people at high risk of Parkinson’s disease before the symptoms appear“. There is now a lot of research suggesting that problems associated with Parkinson’s (such as loss of sense of smell, sleep problems, constipation, anxiety and depression) can begin to appear many years before the movement problems appear and subsequent diagnosis of Parkinson’s is made. If we can better identify individuals at risk of going on to develop Parkinson’s, we may be able to start treating them earlier. This is the goal of the PREDICT PD study – Click here to learn more about it. The project is funded by Parkinson’s UK. The folks at the PREDICT-PD study also maintain a really good blog – Click here to have a look. To finish off the section on clinical trials, Dr Katherine Deane from the University of East Anglia discussed the co-creation of guidance & quality criteria for patient engagement in the clinical research. Good advice for all of the new clinical trials starting up in 2019! Before lunch on the second day of the conference there was also a session called ‘Neuroimaging biomarkers for Parkinson’s: where are we?‘, and in this session there was a fantastic sets of lectures presentating new research on all of the various methods of brain imaging which are being applied to Parkinson’s. 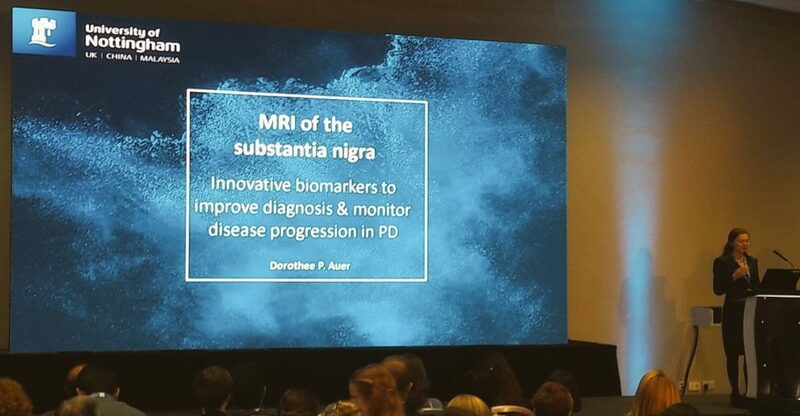 Of particular interest in this session was a presentation by Prof Dorothee Auer from the University of Nottingham, who provided a impressive overvew of how magnetic resonance (MR) brain imaging is being used to investigate the substantia nigra area of the midbrain – a region near the top of the brainstem. 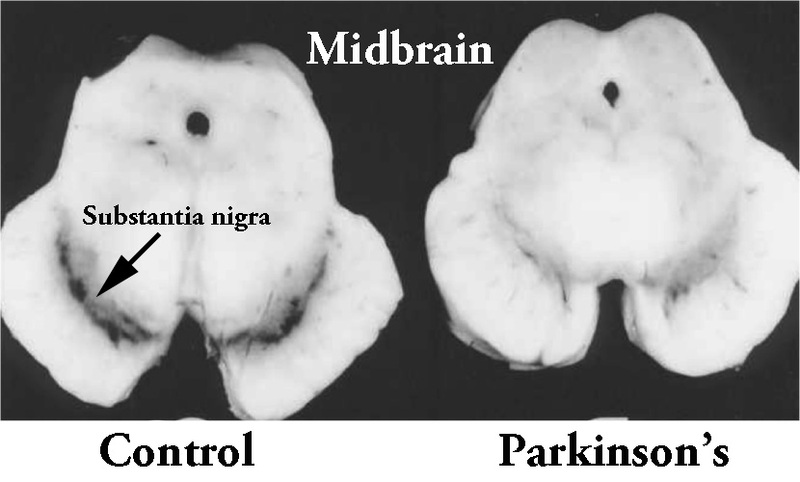 The substantia nigra is a region of the brain is where dopamine neurons reside – these are the cells that are lost in Parkinson’s. Dopamine neurons in the substantia nigra produce a chemical called neuromelanin which can not only be visualised with the naked eye due to its dark pigmentation, but also using MR imaging techniques. Given that these neuromelanin containing cells are lost in Parkinson’s, neuromelanin MR imaging could be a useful tool in tracking PD. Title: Life span pigmentation changes of the substantia nigra detected by neuromelanin-sensitive MRI. Authors: Xing Y, Sapuan A, Dineen RA, Auer DP. In this study, the researchers conducted brain imaging of neuromelanin containing cells in a group of 129 healthy participants who were aged between 5.1 to 82.7 years. The resulting images demonstrated the natural history of neuromelanin in the midbrain across the life span of humans. There was a rapid increase in the ability to visualise neuromelanin cells in individuals under the age of 20 years, followed by a slow increase to a plateau between 45-53 years of age. 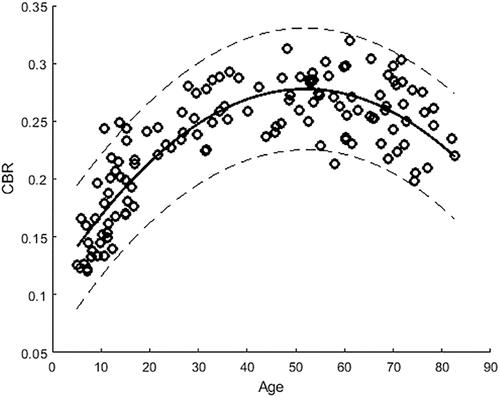 After this peak there a gradual decrease with increasing age (see image below). It will be interesting to see how neuromelanin MR brain imaging improves in the next few years. Prof Studer has been at the leading edge of this field for almost a decade and all of that work and effort is about to come to fruition with a clinical trial starting in the very near future (Prof Studer hopes that his team will be given the green light from the regulators before the end of 2018). During his presentation, Prof Studer led the audience all the way through the history of cell transplantation for Parkinson’s – from the very beginnings to the current efforts of his team to take embryonic stem cell derived dopamine neurons to the clinic. He also provided information about the structure of the new clinical trial, which is being conducted by a company called Biotech BlueRock Therapeutics. The trial (called STEM-PD) will be an open label (meaning everyone will be aware of the treatment being administered) Phase I/IIa safety and tolerability study involving 10 individuals with moderate to severe Parkinson’s (5-10 years since diagnosis). Secondary aims of the study will be focused on the survival of the transplanted cells (as measured by brain imaging) and signs of efficacy (UPDRS part III motor score). The surgery will be a single session, with 3 injections of cells being made on each side of the brain. Each of the 3 injections of cells will involve 3 deposits at different sites along the injection track in the putamen. Two doses of cells will be evaluated in the study – a low dose (0.9 million cells per side of the brain, which should result in 100,000 surviving cells) and a high dose (2.7 million cells per side of the brain, which should result in 300,000 surviving cells). And all of the participants will be on immunosuppression medication for 12 months to insure that the cells have the best chance of survival (without immunosuppression there is the chance that the immune system will view the transplanted cells as foreign and kill them). Fingers crossed that the study be allowed to begin soon. 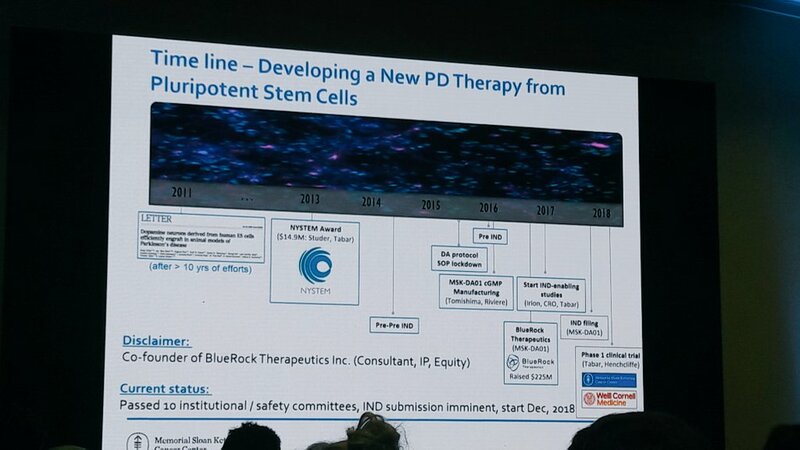 Prof Studer’s then concluded his talk with a quick blast of new data from unpublished research, and speculated about where the field could be heading in the future (for example, transplanting engineered cells that either produce therapeutics or are resistant to Parkinson’s). It was a hugely impressive lecture and a very fitting end to a fantastic conference. Overall it was a very good conference, providing a broad over view of the research being funded by Parkinson’s UK. There was also a very good balance of research areas in the presentations, providing something for everyone at the event. Due to space (and time), I have only been able to mention a few of the talks here in the post today, which has not done them (or the unmentioned presentations) the service they truly deserve. And if you would like to learn more about all of the presentations, click here to see the full programme. Finally, I would just like to give full credit to the organisers at Parkinson’s UK for an excellent event. It was fantastic to catch up with (and meet) members of the research community, and to see some extremely impressive research being presented. I very much hope to be able to attend the next event in two years time. 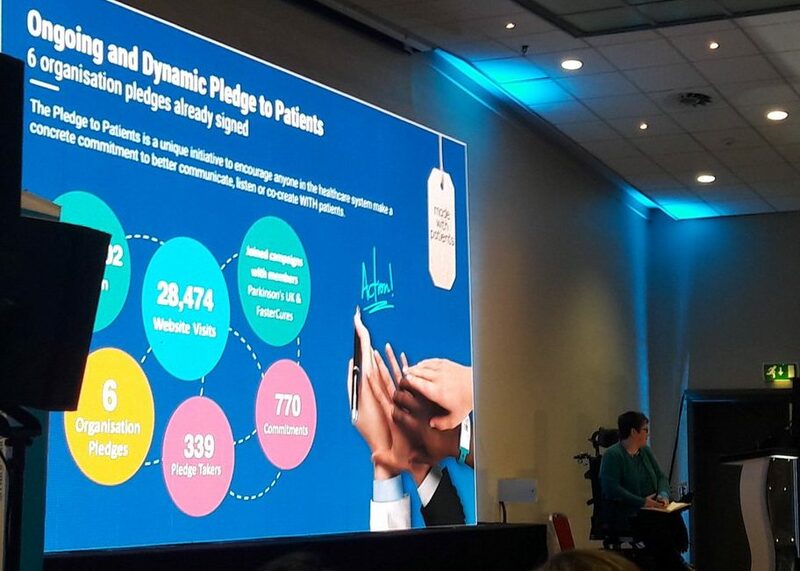 FULL DISCLOSURE: The author of this blog is an employee of the Cure Parkinson’s Trust and was attending the Parkinson’s UK conference in that capacity. Neither Parkinson’s UK nor the Cure Parkinson’s Trust have requested the production of this post or were not contacted regarding it. This post has been provided solely by the author as he was impressed by the meeting and some of the research that was presented, and he thought that readers may be interested. All thoughts and opinions expressed here are those of the author and may not necessarily reflect those of associated parties. In addition, some of the companies mentioned in this post are publicly traded companies. That said, the material presented on this page should under no circumstances be considered financial advice. Any actions taken by the reader based on reading this material is the sole responsibility of the reader. None of the companies have requested that this material be produced, nor has the author had any contact with any of the companies or associated parties. This post has been produced for educational purposes only. thanks for the report Simon. very good reportage. Simon, thanks for the report ! 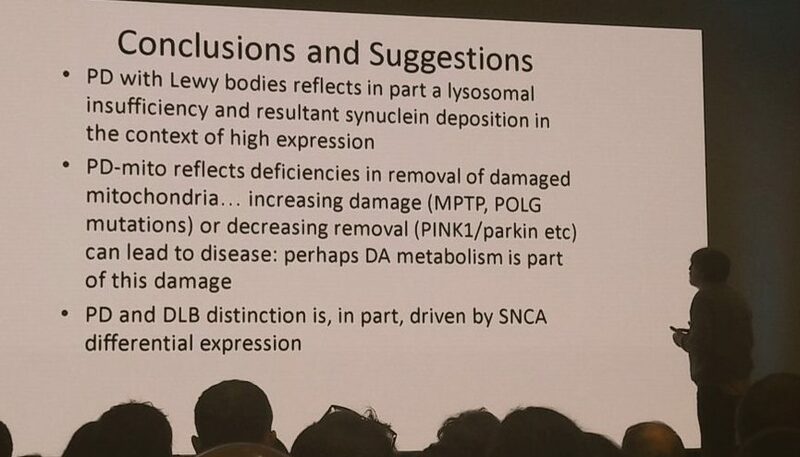 The message from Dr. Williams-Gray regarding inflammation markers of progression-rate rings loudly in two ways for me – 1) yet more support for classification of PD groupings (and the critical importance of same for clinical trials), and 2) more emphasis on inflammation as a window on PD etiology. In the case of the former, I have recently learned that a very successful current business model for biotech/pharma start-ups (not necessarily PD-related yet) is to buy the rights to treatments that have FAILED in clinical trails (at garage-sale pricing obviously), and then pour over the trial participant information – mostly performing/reviewing genetic analysis on the original trial cohort, finding commonalities within the cohort that group either “failures” or “successes”, and then starting a new clinical trial process using the new grouping knowledge to include/exclude participants. I wonder how many “rejected” PD treatments could be resurrected from the trashcan by this process? Such efforts wold obviously cost a lot less and take much less time than identifying and trialing new treatments from scratch. Regarding the latter, Dr. Williams-Gray’s report points towards the possibility that peripheral immune changes might causally contribute to the progression of PD. While we should explicitly acknowledge the corollary that immune changes may simply be a result of PD (a chicken-and-egg conundrum? ), there is mounting evidence of the involvement of immune response in many cases of PD. Look at the hundreds of reports of the effects of various natural and synthetic anti-inflammatory compounds on various models of PD for instance. Given that knowledge, should we not push for clinical trials to start screening for a broad set of immune markers as a matter of course until such time as the practice is discredited or a better biomarker comes up? This is a lot less invasive and costly than CSF screening for a-syn. Do we really have to wait for years for a particular biomarker to be “officially” recognized before we stop throwing away potentially useful information?